Pressure Washing is what we do. Perfection is what you’ll see. We Pressure Wash Pavement, Driveways, Decks and Brick! Has your driveway taken a beating from last winter? Trying to find the best pressure washing company? Looking for a local company dedicated to perfection? Our Pressure Washing services utilize specialized detergents and commercial pressure washing equipment to clean stubborn roof moss and hard pavements effectively without causing any damage. Best of all, we are Eco-friendly! call us today at (425) 922-3939. Absorbent surfaces are prone to staining, especially those that are located outdoors. 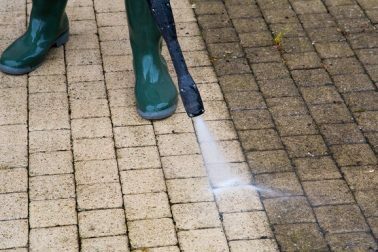 While it’s not completely possible to prevent dirt and debris from adhering to these surfaces, it can be quickly cleaned up with pressure washing in Issaquah, WA. At Reflection of Perfection, we are proud to offer the leading pressure washing services in the industry. Power washing is the only way to successfully rinse away years of buildup. Dirt, mold, weeds, and even old paint can all be washed away with this proven technique. High-pressure water is sprayed directly onto the surface, where it quickly loosens and washes away years of staining. It’s commonly used by homeowners to clean brick, concrete, decks and even stucco. Pressure washing is also popular with business owners who want to maintain a clean facade. Pressure washing in Issaquah, WA not only removes tough stains, but the results are also long lasting. After a professional cleaning, your porous surfaces will look brand new. It only takes a couple of hours to remove years of dirt from these hard-to-clean surfaces. Not only is power washing effective in transforming the condition of your property, but it also makes it easier to reach every nook and cranny. The water can be aimed directly at stains and debris, even if the target is located on a higher level. Professionals have the equipment needed to reach every inch of your property. It’s effective on buildings, porches, decks, and even sidewalks. When you hire our professionals at Reflection of Perfection to power wash your dirty surfaces, we guarantee impressive results. Pressure washing is a cost effective way to protect the surfaces around your property from damage. It can also raise your property value by improving the visual appeal of your home or business. Pressure washing can be a great addition to a home seller’s checklist. Who Should Take Advantage of Professional Power Washing in Issaquah & North Bend, WA? Over time, outdoor surfaces are bound to get dirty. Brickwork, concrete and stucco are tricky to clean without the right tools. Both homeowners and commercial companies can benefit from professional power washing in North Bend, WA. At Reflection of Perfection, we can wash away years of dirt and grime from even the hardest to reach surfaces. It’s not possible to simply scrub away dirt that is deeply embedded into concrete or other hard, penetrable surfaces. Hiring a professional power washing company is the best way to restore these surfaces to like-new condition. Power washing involves using highly pressurized water and detergents to wash away even the toughest stains. When done correctly, pressure washing can penetrate deep stains, without causing any damage. It’s also ideal for hard-to-reach surfaces, such as multi level gutters and eves. Dirt and debris is no match for commercial power washing equipment! Professional power washing instantly removes years of wear and tear from hard surfaces. Homeowners will improve the curbside appeal of their property, and business owners will find their freshly cleaned surfaces draw in more customers. Scheduling professional pressure washing on a regular basis will also increase the lifespan of your hard surfaces. Why People Should Not Try DIY Methods of Pressure Washing in Issaquah, WA? While it may seem tempting to try to pressure wash your own surfaces, we do not recommend it. Even with all the DIY equipment and techniques available, you will not get the same professional results that we guarantee every customer here at Reflection of Perfection. Proper power washing requires both skill and the proper equipment. Homeowners who attempt to pressure wash their own driveways, roofs, or windows may end up damaging their property. DIY methods are not as gentle as commercial products. It’s common for homeowners to find new scratches and pitting after attempting pressure washing on their own. Amateur pressure washing can also be dangerous. Homeowners who attempt to clean hard-to-reach surfaces on their own may fall and hurt themselves. A professional company will put proper precautions in place to prevent on-the-job injuries. It’s impossible to thoroughly pressure wash your property without the right tools. At Reflection of Perfection, we will bring everything necessary to get the job done right the first time. Professional power washing gives long lasting results that cannot be obtained on your own. If you want your freshly washed surfaces to stay cleaner for longer, then hiring a professional company is the only way to go. Why Choose Us for Power Washing in Issaquah, WA? Here at Reflection of Perfection, we are dedicated to providing our clients with the best power washing service in Issaquah and North Bend, WA. You’ll find our service is top notch, and our prices are very reasonable. With more than 15 years of experience, you can trust us to clean your surfaces quickly and efficiently. Our work is guaranteed, and we never take any shortcuts. Your property is important to us. That’s why we take care not to damage any surfaces. Our commercial pressure washing equipment is designed to clean quickly, without scratching your property. We only use biodegradable detergents at every job. Our technicians always take the necessary precautions to make sure your job is completed in a safe manner. Every job must meet our high quality standards. We won’t leave until you are completely satisfied! You are sure to be impressed by your freshly pressure washed surfaces once we leave! When you choose our pressure washing services, you are getting a company that goes above and beyond to please every client. We routinely receive 5-star ratings from our customers! Our commitment to excellence is evident in every job we complete. If you’re ready to clean your hard surfaces, give us a call at 425-922-3939 to arrange a service time that fits within your schedule. Q: Can you power wash my house? A: We soft wash houses. This is a low pressure system that will not damage your house siding, paint or exterior house surfaces. Q: Is pressure window washing a service you offer? A: We do offer window cleaning services but, we use low pressure, ultra-purified water to clean windows instead of a pressure washer.